Easy Curtains For Any Space! 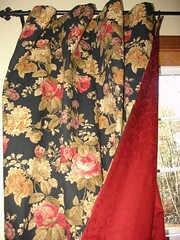 The piece of fabric that I made this set of curtains from is no exception. When I saw the bolt of fabric in the Walmart craft section, I knew I needed to buy some – especially at the $3 pr yard price! When we were finally able to move into our new home, I had the perfect place to use that piece of fabric that I had secretly tucked away a few years ago. There are 2 windows in the living room. Because the windows flank both sides of the love seat, I decided to make one panel per window. During the day I open them up to the outside of each window which makes them look like a “pair” from the other side of the room. This type of window treatment is very easy to make! They remind me of a big pillowcase (except the opening is sewn shut 🙂 I like to line the curtains unless both sides of the fabric are pretty to look at. After all, you want the folks outside to see something pretty as they look at your house. After looking everywhere for the cheapest hooks, I found JoAnn Fabric to be the cheapest. They have a 10 pack of iron ring hooks for $4.99! There are lots of different types of round hook clips, but the iron ones are my favorite. Not only do they look nice, but they seem to be much stronger as well. I made another set like these for my bedroom with NO SEWING at all! I simply used tablecloths that I picked up as an end of season sale for a few dollars each. They were the perfect length for a luxurious puddle effect at the bottom. You could also use a flat sheet, which would make it very easy to coordinate your curtains with your bedding. I like your new curtains and love the floral print. I have always made curtains from tablecloths. You get a lot of fabric for your money. I buy them on sale too. A few years back, I made curtains for my kitchen with checkered red/cream tablecloths from Target. You did a great job. Thanks for the easy instructions! Wish I would have thought of that when I went to 6 Targets a few months back in order to find enough of the same item – I could have just gone to Joann’s. Gives me even more reason to finally invest in a sewing machine. I love your easy instructions for making curtains. I want to make my own but I thougt it was a lot harder. I always check the bargain bins at Walmart for different fabrics for different crafts. I am not a whiz on the sewing machine but this is something I can do. Thanks. Left you a comment on Flickr. The curtains are just lovely. Check out the material that I bought. It’s similar to yours. I used it on my side table this Christmas, but I intend on using it for cushion covers.